It is almost traditional to make high-value purchases during Dhanteras and Diwali. These are occasions when developers across the country come up with innovative schemes, offer easy home loans, complimentary facilities and promise reduced interest rates and more, to attract home buyers, particularly those sitting on the fence and unwilling to make a commitment. The festive season spans from October right through to December. Says Lalit Makhijani, Chief Marketing Officer, Godrej Properties, “Both developers and customers look forward to the festive season given that customers expect offers and great deals coming their way and developers expect increased sales.” Agrees Harinder Dhillon, Vice President - Sales, DLF. “We have so much to offer this time and the handover of our latest property, The Skycourt has already begun. Transactions have already increased significantly and we expect this number to increase even further with respect to the last season,” says Dhillon. Not all developers, though, agree with the trend. “In an industry like ours the festive season will not see sales shoot up like the retail or FMCG segment but the number of enquiries increase manifold, suggesting a strong latent demand,” says Ashish R. Puravankara, Managing Director of Puravankara. The Bengaluru-based firm has projects across the southern and western region. Puravankara says a large chunk of enquires come from NRI customers visiting their native land during festivals. “In fact for our existing and upcoming projects in Southern and Western India most NRI customers choose these festival holidays to finalise pre-selected projects like ours. Thus, this is one of the major reasons which propels the sales figures in the third quarter,” says he. J.C. Sharma, Vice Chairman and Managing Director of SOBHA, another leading developer headquartered in Bengaluru, recalls that sales “were not encouraging” around Diwali last year owing to the “transitional challenges of RERA and GST”. “Most home buyers were cautious and took their time to decide on buying a home. This was reflected in the numbers. For instance, in FY 16-17, the overall increase in sales across the country was around 10-15 per cent during festivals, which was a positive sign, post demonetisation,” says Sharma. “We had released fresh inventory into the market through new tower launches during festive periods last year,” recalls Gaurav Sawhney, President, Sales and Marketing, Piramal Realty. “This year too, we are gearing up to introduce fresh inventory in two of our developments. Given the festive atmosphere and our product offering, we are confident of accelerating sales numbers through these new launches,” says Sawhney. There is one segment of the realty market that is completely apathetic to seasons, be they festive or otherwise, and that is the luxury segment. Says Manish Jaiswal, CEO, Tribeca. “Tribeca’s focus has always been to deliver highly differentiated branded residences with superb customer experience in any micro-market. Since most of our inventory falls in the luxury category, sales is season agnostic and robust all year round.” But things are changing in this segment too. 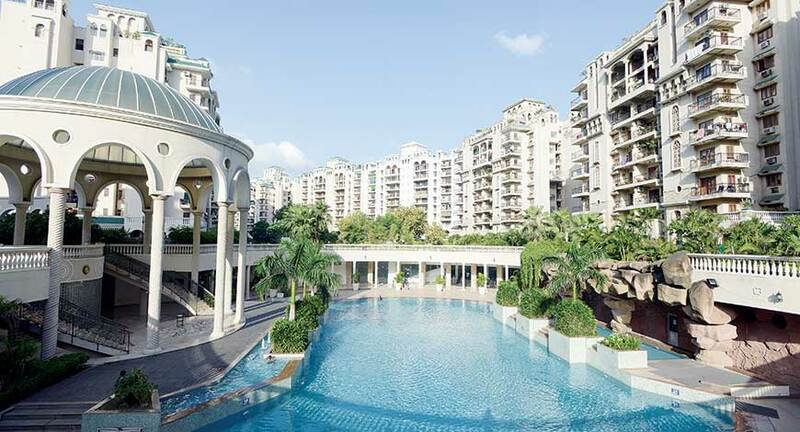 Tribeca is set to launch its first international branded residence in NOIDA this festive season. “Historically, most of the launches done in the festive season demonstrate better sales performance,” says Jaiswal. “Keeping that in mind we have aligned the launch of our first international branded residence in NOIDA this festive season.” Jaiswal recalls that during the last October-November period, Tribeca had launched and sold nearly 80 per cent of Trump Tower Kolkata units. “This phenomenal success, however, is not just attributed to the festive season, but also to a highly differentiated brand and product. In fact, nearly 50 per cent of festive demand in Kolkata’s luxury residential market last year was contributed by Tribeca” claims Jaiswal. Reforms such as RERA and GST have had a positive impact on the real estate industry, making it more transparent and efficient. Puravankara though feels that the RERA environment had witnessed a decline in new launches. New project launches are more spaced out now, he says. “And this coupled with the GST advantage of buying a ready-to-move-in, the demand is high for ready inventory,” says Puravankara. 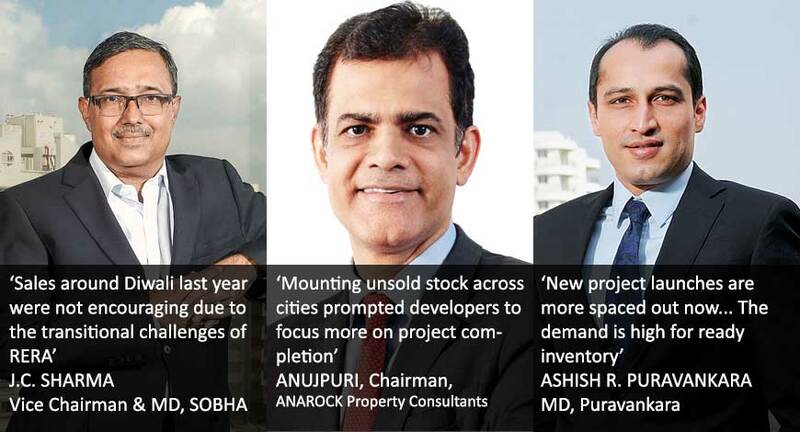 Anuj Puri, Chairman, ANAROCK Property Consultants, shares the view. “Over the last few years, mounting unsold stock across cities prompted developers to clear their stock and focus more on project completion than launch new ones,” says Puri. Data with ANAROCK suggests a lot of supply in the market - both in the ready-to-move-in and under-construction categories. “The overall unsold stock across the top seven cities as on Q2 2018 is 7,00,800 units, denoting a decline of over 10 per cent against the corresponding period in 2017. Likewise, the resale market is replete with options,” says Puri, adding that demand is returning on a cautious note as buyers are focusing only on completed projects. “Affordable housing too has witnessed strong signs for growth and the upcoming festive season will only add to the expanding business,” says Rajat Johar, head of residential services at CBRE India, a leading real estate consultancy firm. Johar expects developers to focus more on existing inventory. “While it is difficult to put a percentage to quantum of sale/purchase, however, a large portion of the sale happens during the festive season,” says Johar. J.C. Sharma, Vice Chairman and Managing Director of SOBHA, a leading developer headquartered in Bengaluru, concurs with the view. “This festive season we are launching a project in the affordable segment in Bengaluru under our SOBHA Dream Series,” says Sharma. ANAROCK says the number of new launches had witnessed a new enthusiasm across the country even before the onset of the festive season, but in the affordable housing segment. Of the total launched units across the top seven cities between January and August 2018, nearly 39 per cent comprised realty projects in the affordable segment (less than Rs 40 lakh), followed by 34 per cent in the mid segment (Rs 40 lakh – Rs 80 lakh). “This is because affordable housing is the highest seller at the moment, owing to the various incentives that the government has extended to budget home developers as well as buyers,” says Puri. Housing projects now offer a multitude of choices. It will be prudent of home buyers, though, to focus on their actual needs in terms of types, size, location and price points of property, and avoid the temptation to over-leverage their budget.